Liberals are having a field day criticizing some conservative media outlets for highlighting some very strange facts about the liberal media's new favorite poster boy for gun control, but the problem is, much of the information is so suspicious that to not highlight the facts would be negligent. After the shooting at Marjory Stoneman Douglas High in parkland Florida, which resulted in the loss of 17 lives, a vocal group of students started speaking out for gun control, yet some strange facts started emerging about some of those students, yet if those facts are reported on, outlets like the Miami Herald started attacking those that dared mentioned these strange facts. The Miami Herald claims that the "political right" on social media are "attacking these shooting survivors, stating "Conservative pundits, outlets and social media posters on Tuesday hit airwaves and social media hard. Some raised absurd conspiracy theories that kids who just endured a horrifying assault are actually “crisis actors” trained to stage “false flag” events. Others questioned the motivations and political backing of students who have been praised by mainstream media, Democratic politicians, gun control groups and television stars like HBO’s John Oliver." What the Herald doesn't mention is within the Gateway Pundit article, there is a direct quote from Hogg himself from a CNN interview where he did in fact say his father was a retired FBI agent, in a segment where Hogg was criticizing president Trump for blaming the FBI for the school shooting. "I think it's disgusting, personally. My father's a retired FBI agent and the FBI are some of the hardest working individuals I have ever seen in my life," student David Hogg said during an interview on CNN. "It's wrong that the president is blaming them for this." After the shooting, it was revealed that the FBI had been warned about the shooter, Nikolas Cruz, on multiple occasions, including just a month before shooting up the school and killing 17 people. The FBI even published a press release stating they did not follow proper protocols which could have prevented the tragedy. The New York Times headlines a piece with "Right-Wing Media Uses Parkland Shooting as Conspiracy Fodder," despite the fact that most of the media that is reporting on Hoggs own statements and history, are not making outlandish claims, but are in fact pointing out some disturbing details about the lefts' new poster children for gun control. Gateway Pundit and others also highlighted an interview with Hogg, by CNN, where he was rehearsing his lines and being coached by the CNN interviewer. Interestingly, the video Gateway Pundit uploaded showing this, was removed from YouTube, with a note stating "This video has been removed for violating YouTube's policy on harassment and bullying." The video was only a minute long, and provided no commentary by the uploader at all. You can see where the video was removed from GP, scroll to the bottom of the article. When the play button his hit it saw it is unavailable, then when clicked to find it on the YouTube site, the following message is provided. There are other copies of the video floating around the Internet, but YouTube has removed some from their site (at least three so far were removed after I found them to embed below and on reload, the same message as the one above shows up), for no apparent logical reason other than to prevent people from seeing the gun control poster boy being coached and seemingly rehearsing his interview lines. The original video was removed despite the fact that it was the number one trending video at the time on YouTube. It appears Google/YouTube really does not want people to see the video, so we will continue to replace them each time one is removed, because the Liveleak version I found won't embed, but can be found at LiveLeak. 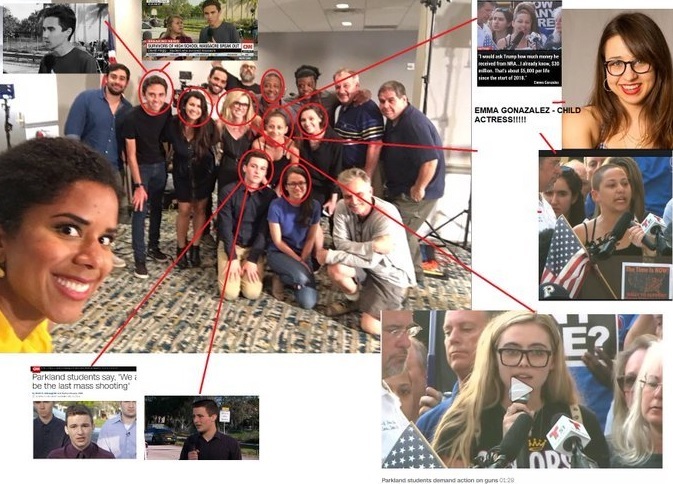 Please note, we are not claiming these students are "crisis actors," nor asserting any claim the event was a "false flag," but rather we are going to provide just the facts as they have emerged about Hogg and others, information and images discovered about the specific group of students that have been the most vocal, a VIP connection with CNN, and a few other things, and readers can decide for themselves if they agree something strange is going on. The image below is of a group image taken, which just so happens to include the group of students being seen prominently all over liberal news, along with images on the side of the main image showing them appearing on cable news. Fact: The person shown in the two images above, bottom left hand corner, interviewed by CNN, is Cameron Kasky, who is a drama student. Fact: Images at the top right corner are of Emma Gonzalez, who happens to have also been interviewed by CNN with David Hogg. 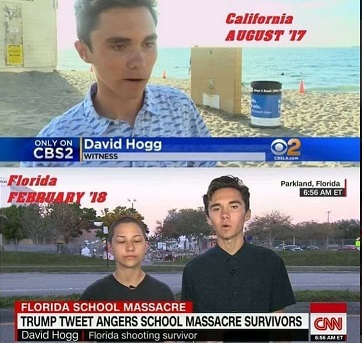 Fact: Hogg, shown in the two images at the top left of the graphic above, one clearing a CNN interview, is the news director the school TV station, and a "student filmmaker," according to his Instagram account. Fact: Hogg publicly stated his father was a former FBI agent. 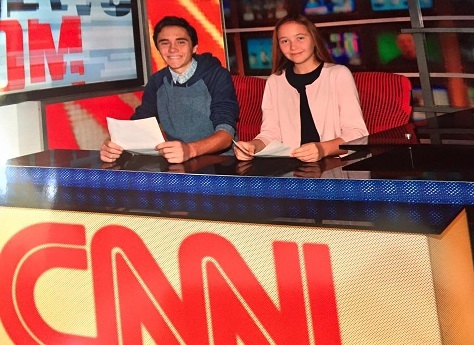 Fact: Hogg is also no stranger to CNN and his mother has posted images in 2016 of her and her son on a CNN VIP tour, including an image of her children sitting behind an anchor's desk, and one of herself posing with her arm around Anderson Cooper. Fact: Hogg's mother is a anti-Trump activist as clearly stated on her own Facebook page. 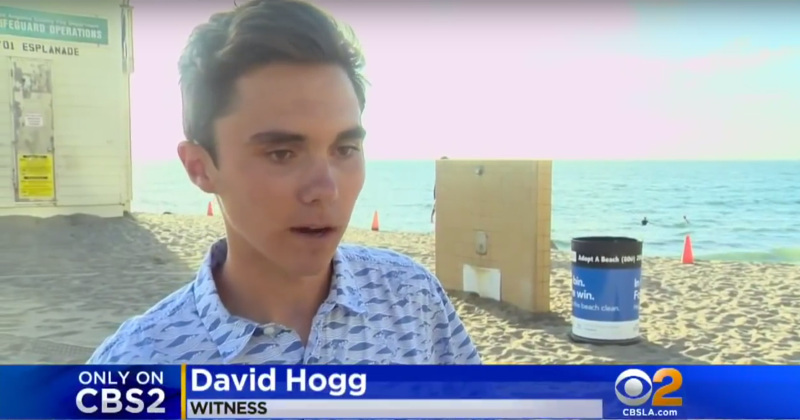 Fact: Hogg had previously received news coverage in California while video taping a confrontation between a young man on the beach and a lifeguard. Fact: The next item is one of the strangest yet, where GOPReload has a video of Hogg claiming he is interviewing students while they were hiding from the school shooter, which he has admitted publicly to CNN saying "If I was going to die, I wanted to die doing what I love, and that’s storytelling. And this is a story that needed to be heard. … At least our echoes, our voices would carry on and possibly make some action." In the video, he states "This recording is taken at 9:32 on February 14th, 2018," then asks the student, Alex, if he was ok with Hogg recording this." The strange part about that, is that according to the New York Times, and others, the shooter did not arrive at the school until 2:19 pm. The heavily armed man, identified as Nikolas Cruz, 19, arrived at the school in an Uber at 2:19 p.m., shortly before dismissal time. He made his way “purposefully” toward the freshman building, said a police report released Thursday. Other vidoes across the web showing portions of those interviews by Hogg do not include that introduction, and show others stating times to be more in line with the actual shooting. See the video at GOPReload, since it apparently does not have an embed code. While other information and claims have emerged, we deliberately only provided verifiable facts above, with the only opinion stated is our belief that there is something strange about how this particular group of students have been chosen by the mainstream media and the liberal Democrats, to be the face, the poster children, for gun control, embraced by all the liberal media outlets, especially CNN, who just so happens to have been the outlet that seemed to be coaching Hogg in one segment. While I have seen all sorts of speculation on line, it appears that even those reporting just the facts, without any attacks, or speculation involved in their articles, are all being accused of pushing some type of "conspiracy," or of attacking the Parkland shooting survivors. When cable news prominently uses children or young men and women to push their own gun control agenda, they cannot then turn around and claim that strange events and facts surrounding the people the media chose to spotlight, is off limits to reporting.